1,000 Sales on Etsy – Thank You! 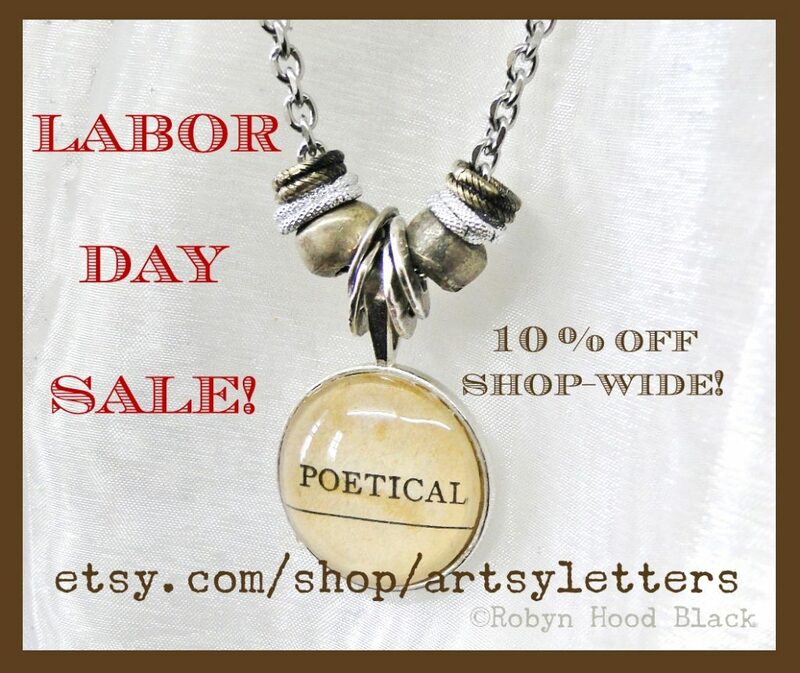 LABOR DAY SALE – Enjoy 10 % off in my artsyletters shop this weekend! 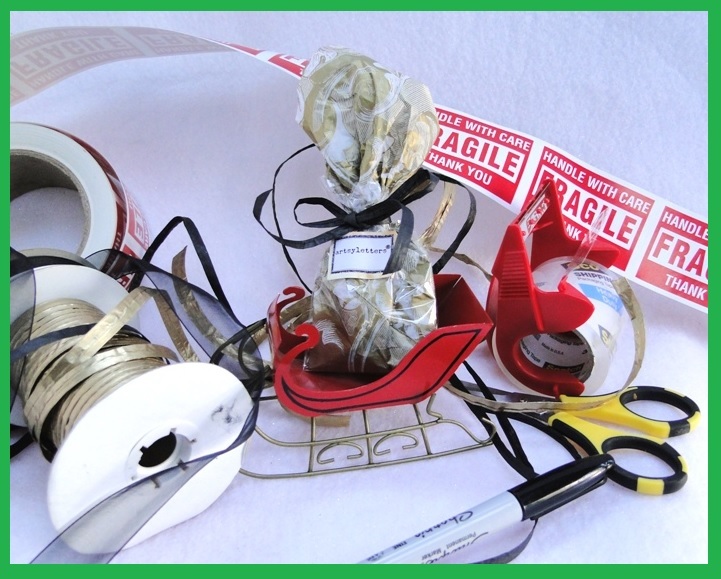 FREE SHIPPING through Monday and SMALL BUSINESS SATURDAY! 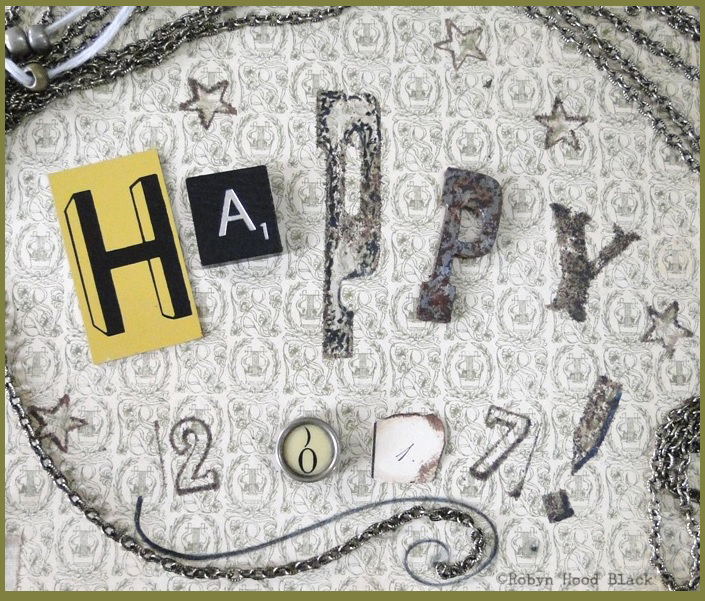 Wishing you and yours a joyful start to the New Year! 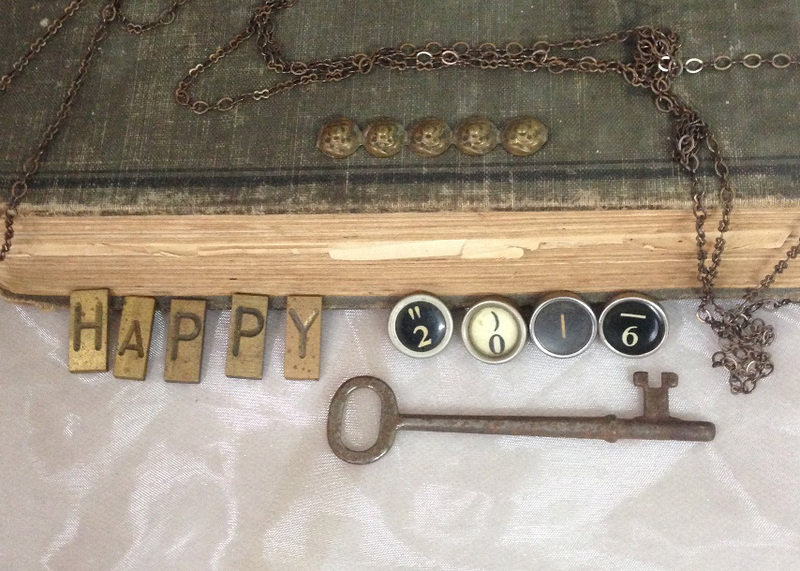 Looking forward to creating all kinds of “literary art with a vintage vibe” in 2016…. Stay tuned! Happy Black Friday Weekend Shopping – Free shipping on US orders of $25 or more with code! Many thanks for visiting. Jingle jingle! I hear them in the distance… jingle bells! Do you hear them, too? 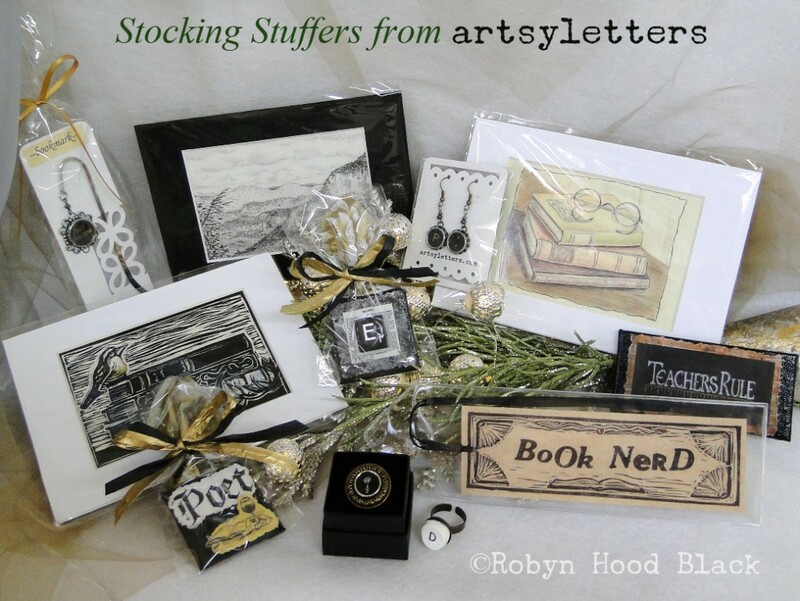 The artsyletters elves (okay, I wish I had some elves!) 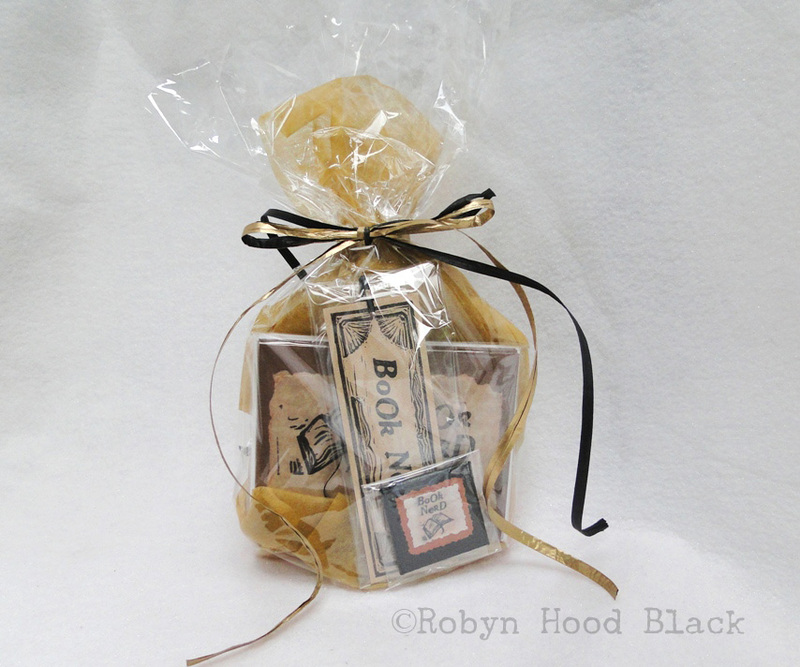 are busy, busy adding new items in ye olde Etsy shop. 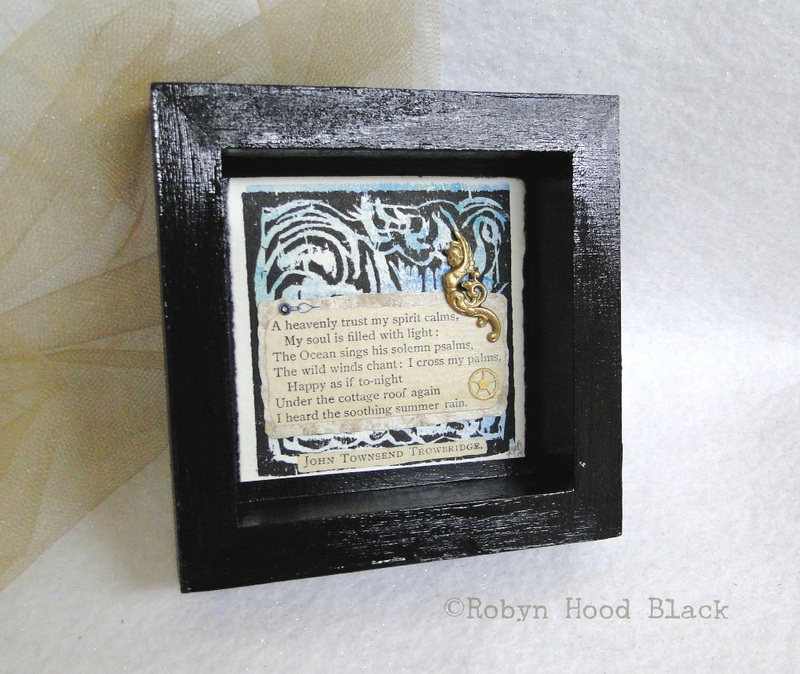 I’ve matting the fronts of some of the note cards to make great little ready-to-frame mini prints – just $4.75! 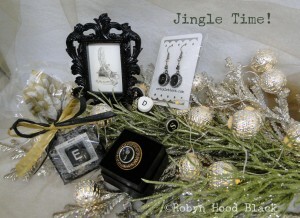 And I’m always adding new vintage typewriter key jewelry and such. 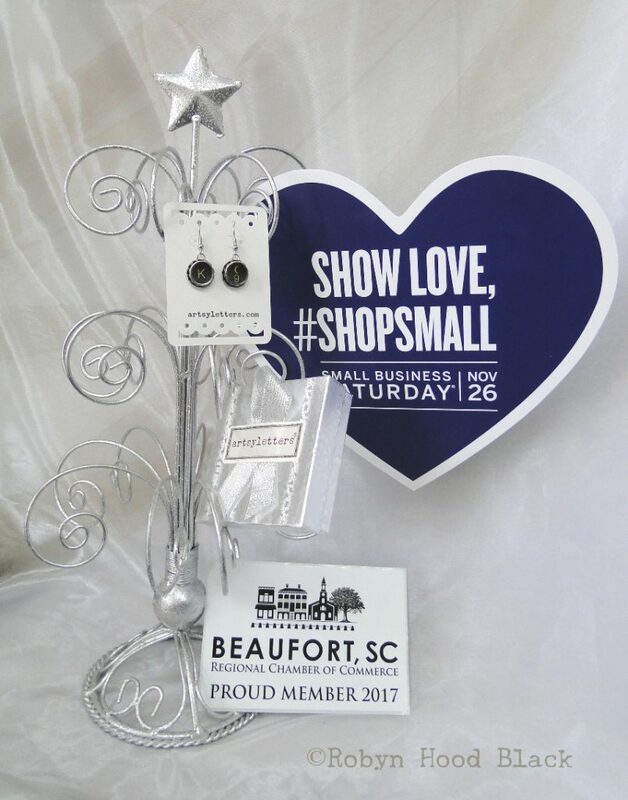 If you’re in the Beaufort area, I’ll be hosting a Holiday Open House in my studio on Saturday, Dec. 5, from 2:00 to 4:30 p.m. – stop by before the boat parade! February winds have made for a blustery bay this week, but that hasn’t stopped visitors from coming to our fair little coastal town. I’ve been busy conjuring up some “sea-themed” items to offer through artsyletters, especially at my kiosk over in Fordham Market. I wrote a wee bit about this in my author blog post for Poetry Friday last week. In that post I showed the elements in progress, but above is one of the finished pieces. 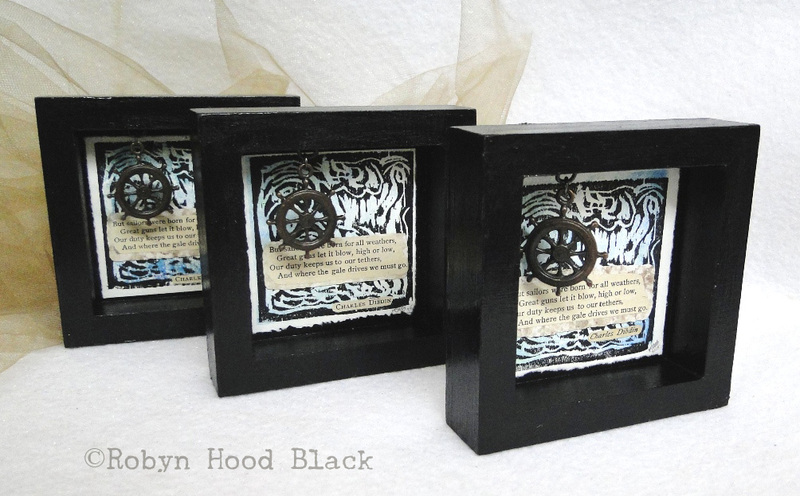 These are miniatures, made from cradled wood boards into small shadow boxes. I painted them black and covered them with acrylic gloss, then antiqued a self-leveling hanger and attached it to the back. compiled by Henry Davenport Northrop, D. D., and published in 1888. It’s actually a refrain to a song, “The Tar for all Weathers,” by Charles Dibdin (1745-1814). Lucky for me, the refrain appeared a few times, so I made three of these. (I was able to find the author’s name in three spots in the book as well.) I’ve put two of these at Fordham and listed the third in my Etsy shop. And where the gale drives we must go. 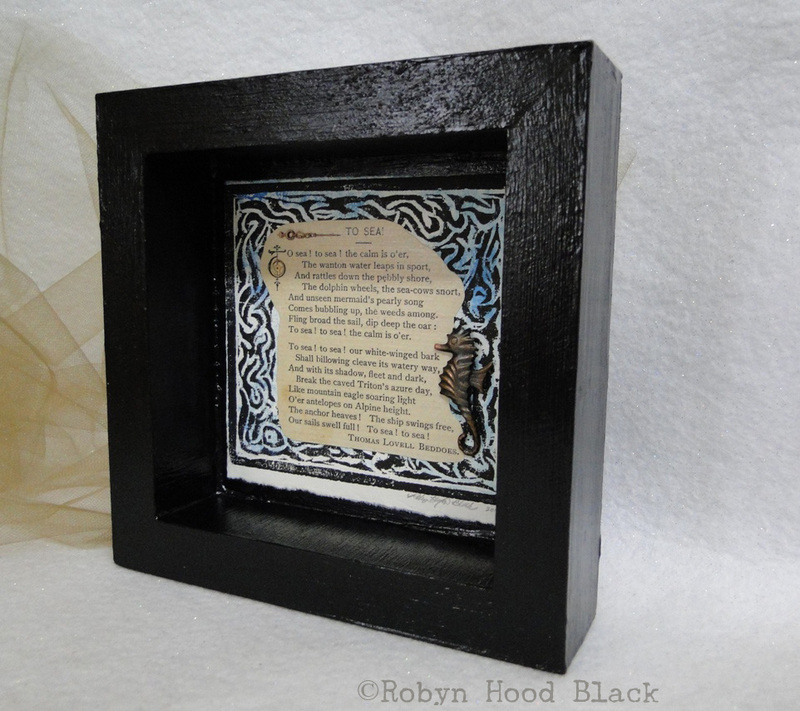 The text is placed atop an original mini-woodcut. I hadn’t done any printmaking in the months since my neck/nerves injury in the fall, and it felt wonderful last week to carve a block or two and roll out the ink (love that smell) and print some images! The ship’s wheel hanging above the text is hand cast from blackened pewter, from a wonderful Etsy shop specializing in antiqued brass. I heard the soothing summer rain. This little piece features tiny vintage watch parts – a watch hand and a wheel, as well as a lovely vintage brass decorative element. It was described as a flying mermaid; I’m not sure, but it is some kind of fantastical winged human creature! Fortunately I was able to purchase a few of these, so they will appear in other work, too. 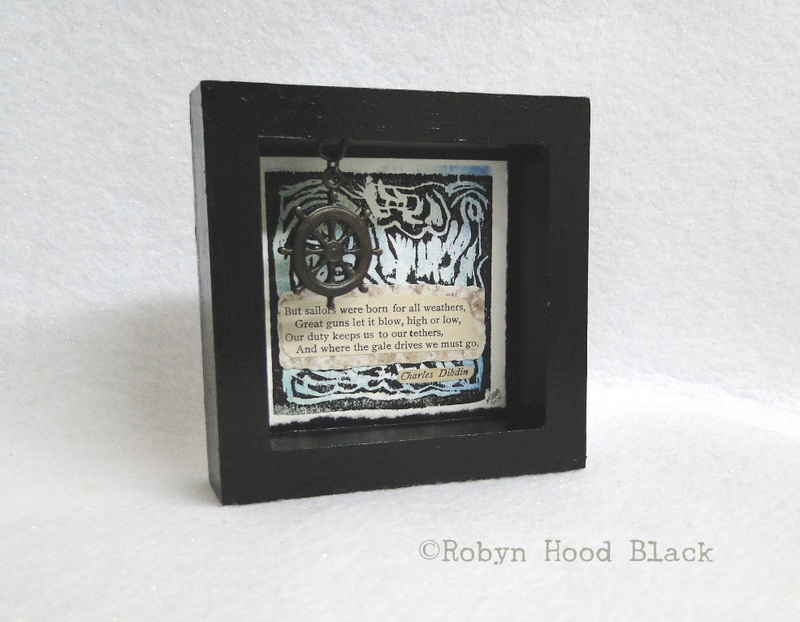 Finally, here is a 6″ by 6″ shadow box/mixed media piece. Again, I made the background by creating a wave-themed woodcut, printing the black image over a block print of mottled blue and green inks. 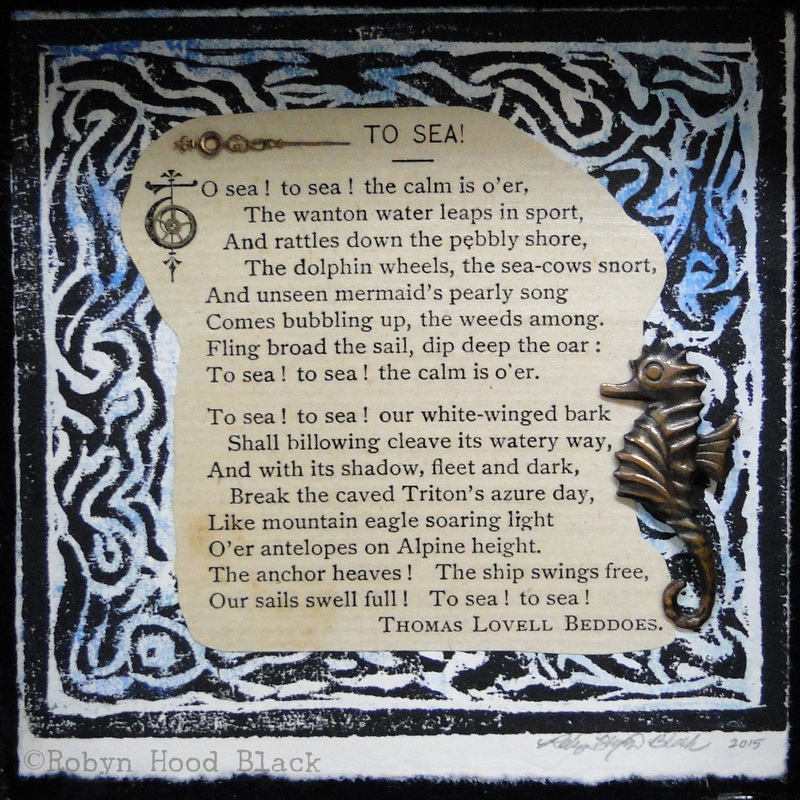 It’s from the same book, CROWN JEWELS, and features a poem by Thomas Lovell Beddoes, “To Sea.” (I’m including a close-up below so you can read the entire poem.) More vintage watch parts on this one – an ornate golden watch hand from France and a tiny wheel which perfectly shows off the decorative illuminated initial “T.” The seahorse is a vintage pin, found by an Etsy dealer in eastern Europe! Thanks for taking a look. Wishing you smooth sailing the rest of the week and right out of winter into spring…! All Packed…. 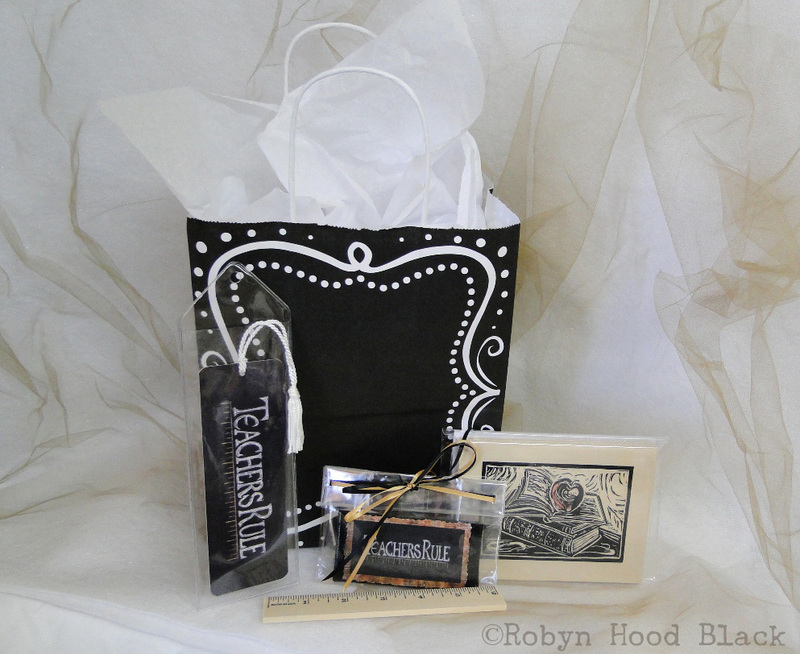 Ready-to-go Gift Sets for Readers, Writers, Teachers, & Creative Types! Holiday Shopping Season is in Full Swing! Wish you had some elves to help? 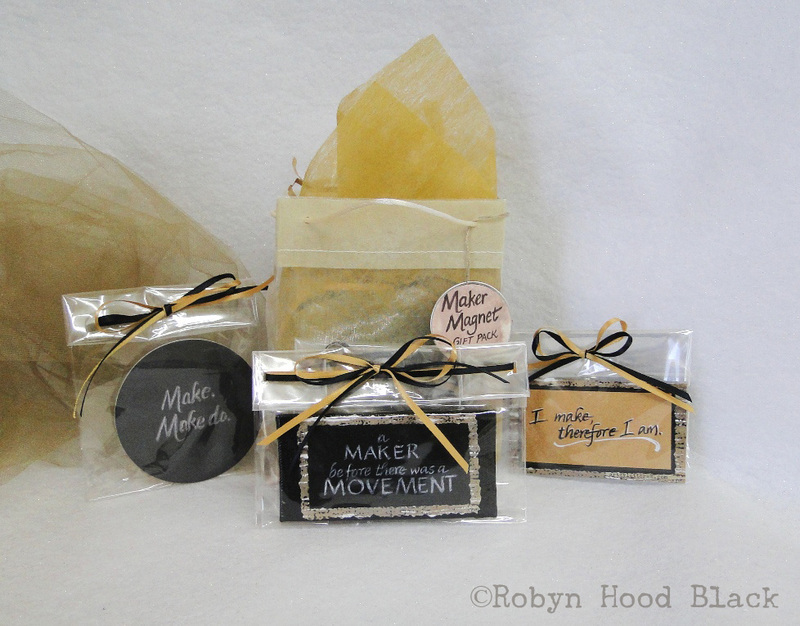 And here are three new gift packs! 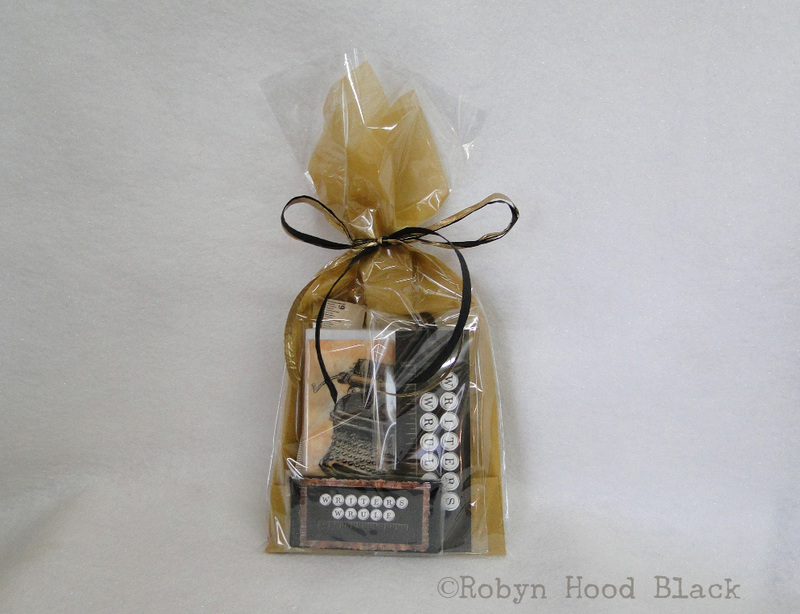 This “WRITERS WRULE” pack includes my typewriter notecards, a bookmark, large magnet, and – again, just for fun – a 6-inch ruler. 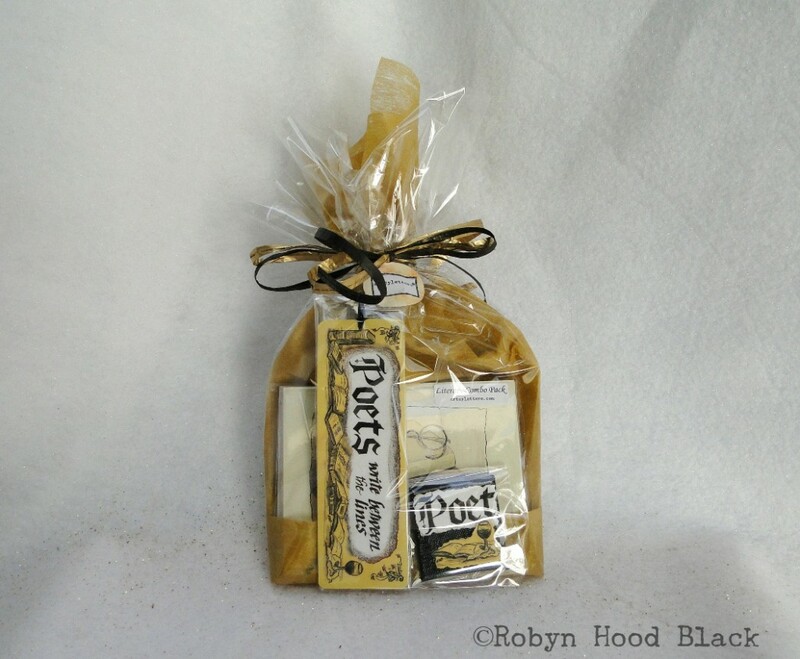 This gift set is $16.50. 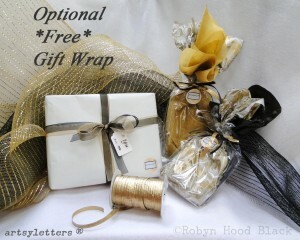 Thanks for taking a look, and may all your holiday shopping be wrapped up without a lot of stress! And may you find or make the perfect gifts for your special someones.